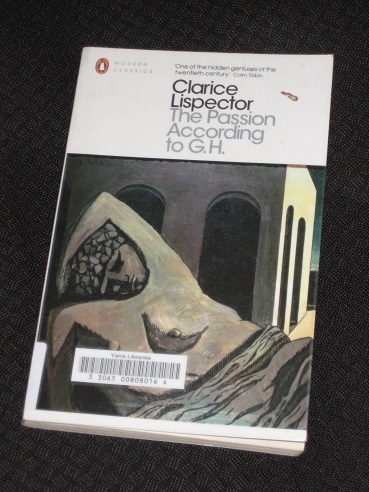 Clarice Lispector’s The Passion According to G.H. (translated by Idra Novey, published by Penguin Modern Classics) is certainly not a book for those in search of a meaty plot. After an initial confused monologue in which the narrator hints at an experience from the previous day that has shattered her world view, the novel looks back twenty-four hours, with the woman (known only as G.H., after the initials on her suitcases) enjoying a leisurely breakfast. With no demands on her time, she decides to clean the room her maid (who has just quit) has lived in for the past six months, slowly walking through her flat and opening the door to the room, expecting to see a dark squalid mess. However, what awaits her in this little-visited part of her realm shocks her. As she walks into the room, she encounters a sun-drenched (sun-scorched) rectangle of light, one she barely recognises, and her sense of disorientation is heightened by the discovery of some crude drawings on the wall. Eventually, her eyes land on the old, battered wardrobe, warped by the constant sun, and coming to her senses, she decides to start cleaning it. Yet when the door swings open, she’s unprepared for what she finds, and even less ready to cope with how her mind reacts to the new situation. In physical terms, there’s very little more to The Passion According to G.H. than what I’ve described. The rest of the novel is spent with the narrator in a sort of catatonic state, either standing or cowering behind the door of the wardrobe, in which she’s discovered a massive cockroach. Sounds compelling, right? Rich woman goes into maid’s room, sees an insect and has a nervous breakdown… Of course, there’s far more to the novel than this. The encounter in the maid’s room is merely a catalyst for the woman to take a moment out from her daily existence; as time slows down to a crawl, the narrator begins to think, the focus on the cockroach centring her and allowing her to reflect on the way she lives her life, and whether it has any meaning. For the first time in my life it was fully about now. This was the greatest brutality I had ever received. For the present has no hope, and the present has no future: the future will be exactly once again present. I was so scared that I got even quieter inside myself. Because it was seeming to me that I would finally have to feel. Her comfort in what she dubs the ‘pre-climax’, the pleasant feeling that all the important things in life are yet to come, is now shattered. There’s no future and nothing to look forward to as there is only the now, meaning that all our energy and focus must go on living life a day at a time. The Passion According to G.H. is marked by its rather episodic nature. After a lengthy introductory piece luring us in, we get the breezy false start of the breakfast scene before the main ‘story’ begins. This consists of short chapters, four or five pages at a time, the last sentence of each one becoming the first sentence of the next section, and thus dragging us onward. For the most part, there’s a fevered, confessional nature to the work, and the narrator speaks to the reader as if to a friend (or a therapist). It’s not always easy to take in what she’s talking about, but while each section takes time to digest, the nature of the structure urges you to keep reading anyway. While it’s not the easiest of works to get your head around, it all makes for an absorbing, enthralling reading experience, but one question remains: are we reading The Passion According to G.H. or the gospel according to C.L.? Is Lispector revealing some hidden truth of existence? Wonderful! I think you’ve captured some of my uncertainty about what I was reading when I first encountered Lispector. She’s not easy, but she certainly gets you thinking furiously! Kaggsy – Yes, lots to think about. This is only my second Lispector, and I got into this much more than ‘Near to the Wild Heart’. I just picked up her Agua Viva yesterday, so while I’ll likely get to this it won’t be for a while yet. I’ve only read her The Hour of the Star so far which I thought very good.